» Thank You for Joining Us on the Internet! other stuff, to be determined later. Thanks to those who followed Lakers-Celtics with us. We’re looking forward to the next one! At LAL-Celts and Rondo is wearing sunglasses in the layup line. Hmmmmmm. PS: Taking my tweets over to @grantlandlive during the game. BS: Kobe is wearing a necklace with Rubio’s ACL dangling from it. I think that’s totally inappropriate. MB: Kudos to Ray Allen for not needing a wheelchair after collision with Bynum. 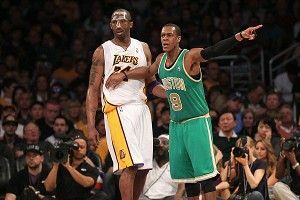 CR: Rondo and Kobe should keep 1 upping each another with face accessories. 1 of them should come out for the 2nd half w/ a black eye patch. DJ: I can’t tell if the ad about the dude who drove his buddies 965 miles to get Taco Bell is an ad for Taco Bell or marijuana. Mays: @HousefromDC That makes sense, House. Derek Fisher’s funeral is an ongoing event. @grantlandlive Has Derek Fisher’s “that foul was on ME?” face officially passed Duncan’s bulging eyeballs as the NBA’s most annoying face? BS: 2 amazing stats: Metta World Peace has played 24 mins, 0 rebs, 0 assts. Also total fouls so far are Lakers 10, Celtics 96. BS: @MatthewBerryTMR Sure thing Berry – I will also let you know when Bynum takes less than 4 steps on a low-post move. Stand by. BS: I just rememberd we were up 94-89 and lost 97-94. I might get in a fight.